Column vol.30 - race | Yamaha Motor Co., Ltd.
As the era changed from the 20th to the 21st century, big changes were taking place in the motorcycle race world. As environmental concerns prompted the shift from 2-stroke to 4-stroke machines, the pinnacle class of the World GP was no exception. In April of 2000, the FIM announced that the regulation for the GP500 class would change in the 2002 season. The displacement limit for 4-stroke machines competing in the class would be raised to 990cc and the weight limit for these 4-stroke machines would be raised in accordance with the number of cylinders to 135 kg (1-3 cylinders), 145 kg (4-5 cylinders) and 155 kg (6 cylinders). For the remaining two seasons before that regulation went into effect, the manufacturers had to continue to compete with their 2-stroke 500cc machines while they worked on the development of their new 4-stroke race machines. For that first season in 2000, Yamaha entered three teams with the five riders Massimiliano Biaggi and Carlos Checa, Régis Laconi and Garry McCoy and Norifumi Abe, all riding the YZR500 (0WK6). In the opening round of the season in South Africa, McCoy and Checa gave Yamaha a 1-2 finish. Then Abe won the Japan GP. In the final round of the season in Australia, Biaggi (ranked 3rd) gave Yamaha another win, it's 6th of the season, which brought Yamaha its ninth Manufacturer's title. Hoping to carry that momentum into the next season and win back the Rider's title as well, Yamaha expanded its roster for the 2001 season to include eight riders. To the returning Biaggi, Checa, McCoy and Abe were added the previous year's GP250 winning pair of Olivier Jacque and Shinya Nakano, perennial World Superbike Championship star Noriyuki Haga and the accomplished Spaniard José Luis Cardoso. 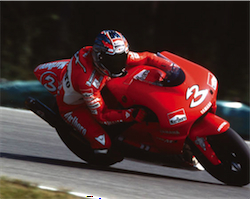 In the end, Biaggi won three rounds and mounted the podium nine times that season to rank a close 2nd. Then came the 2002 season. 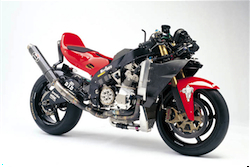 The name of the pinnacle class was changed to the MotoGP and the various makers' new 4-stroke machines made their debut. Yamaha's new YZR-M1 (0WM1) mounted a 4-stroke, DOHC, in-line 4-cylinder engine on a frame based on that of the YZR500. Biaggi won two rounds that season to rank 2nd again, while Checa also started the season well with a 3rd-place podium finish at the opening round in Japan and went on to rank 5th. Six riders rode the last YZR500 model (0WL9) and used its lightness and pick-up to compete well in the mixed field. Abe racked up points consistently to finish the season one place behind Checa in 6th in the YZR500's last hurrah. 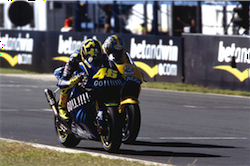 When the MotoGP became a 4-stroke only contest the following season (2003), however, the new YZR-M1 (0WN3) with its fuel injected engine, new-design frame and engine management system for boosted competitiveness, it was still not enough to win races. That season Yamaha fielded two teams with this new machine and new riders Alex Barros and Marco Melandri, but the highest ranking Yamaha's riders could take at season's end was Checa's 7th. Looking forward to the 2004 season, the Yamaha technical team decided to rethink the direction of their race machine development. Bringing in new designs like a crossplane crankshaft for the engine and other state-of-the-art technical know-how, they built a radically new YZR-M1 (0WP3). Yamaha also brought another very big trump card to the 2004 season by signing Valentino Rossi. Rossi was not only a super-fast rider but also a sharp contributor in machine development, qualities that had won him the nickname "The Doctor." Rossi would prove that reputation by bringing out more than 100% of the new YZR-M1's potential in winning the pole position in the opening round of the 2004 season and going on to a pole-to-checkered victory in his debut race with Yamaha. Throughout that season, Rossi continued to win consistently, taking nine victories in the 16-round series to claim the championship title. For Rossi, it was his fourth consecutive title, while for Yamaha it was the first Rider title in the pinnacle class in 12 years, since Wayne Rainey in 1992, and the 11th Rider title since Yamaha began competing in the GP500 class. Although Rossi's close relationship with Yamaha continued for seven seasons, even the best of friends have to part sometimes. After winning four MotoGP titles with Yamaha through the 2010 season, Rossi decided to move on to his next challenge with Ducati. At the end of the 2010 season, Rossi looked back on the seven years with Yamaha: "Many things have changed since that far-off time in 2004, but especially 'she', my M1, has changed. At that time she was a poor middle-grid position MotoGP bike, derided by most of the riders and the MotoGP workers. Now, after having helped her to grow and improve, you can see her smiling in her garage, courted and admired, treated as the 'top of the class'. Unfortunately even the most beautiful love stories finish, but they leave a lot of wonderful memories, like when my M1 and I kissed for the first time on the grass at Welkom, when she looked straight in my eyes and told me 'I love you'! "